They're the subject of a humorous piece at The Onion that's going the rounds. Supposedly it took them 541 hours to finish the Tour de France. I can't wait to see the piece they do on the non-doping pro golfers who take 541 strokes to make it around the golf course. Or the non-doping pro baseball sluggers who can hit the ball an impressive 54.1 feet. Or the non-doping football players who can charge 5 yards and then get injured by one of the bigger guys and can't make it back into the game for 5 months. The biggest joke of all would be seeing any one of them submit to out-of-competition drug tests. Wouldn't that be a hoot!? The tentative riders' list for La Vuelta Espana is now posted over at Velonews. 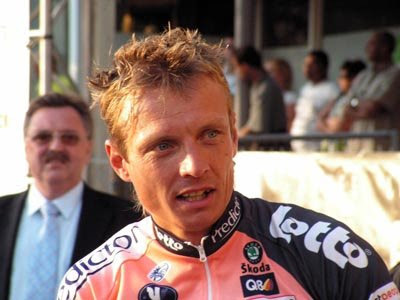 Previous Lanternes Rouges include Magnus Backstedt on the list for Liquigas (and Filippo Pozzato on their reserves). Climbing specialist Leonardo Piepoli is also returning to the peloton for Saunier Duval - Prodir. "Jason Giambi escaped punishment from commissioner Bud Selig because of his charitable work and cooperation with baseball's steroids investigator." So do you think if Sinkewitz and Vinokourov and Rasmussen had been involved in more charitable work and had cooperated, they would have gotten off the hook? I'm sure if Lance Armstrong had ever tested positive for doping, they wouldn't have punished him because of all the good work that he's done for cancer survivors. It never fails to amaze me how quickly the media proclaims pro cycling is dying because of doping, when the same writers simply shrug at the rampant doping that is entrenched in non-Olympic major league sports (that have apparently never heard of out-of-competition drug testing). It looks like Slipstream has indeed grabbed another one of my favorite riders, Swedish national road race champion and former Lanterne Rouge: Magnus Backstedt. I don't blame him, after being left off the 2007 Tour roster by Credit Agricole Liquigas. "Stage eight was a real stinker, I got dropped really early and rode a hundred kilometres in my own, and somehow I got back onto the gruppetto for the last col. I thought it was all over, but I never thought about giving-up, I don’t know how I kept going, but I did. " Because the odds are stacked against getting caught. How many blood tests for EPO or blood doping do you think were run during the Tour de France? A grand total of forty post-race blood tests, according to this article. I'm assuming that's for a full blood workup for EPO, exogenous RBCs/blood doping, etc. They do more hematocrits than that before the Tour, but those are simple and easy to do and all you need to stay out of trouble do is to keep your values within normal ranges. Let's see, let's assume they tested 20 stage winners of 20 stages. That leaves 20 random tests for the entire rest of the peloton during the tour. For an average of about 160 riders riding 20 stages. Or about 3200 rider-stages. Just don't win a stage and you have less than 1 percent chance of getting blood-tested on any given stage. There's perhaps a 80-90% chance that you won't get blood-tested at all during the Tour on any stage. And as I understand it, if the test isn't administered within a few days after EPO administration, it won't detect it. Or even if all the tests were given randomly, there's still less than a 2% chance of getting blood-tested on any given day. And let's see, those 40 blood tests netted something like a 5% hit rate - Vinokourov for blood doping and Mayo for EPO. If the whole peloton is doping at that frequency, there are somewhere between 6 to 8 other riders in the Tour who would have tested positive for EPO or blood doping. If they were tested, that is. All the other testing (400 pre-stage "blood screens", 140 post-stage urine tests) netted only a couple positives, Moreni and Sinkewitz, correct? (0.4% hit rate). Seems like it would be appropriate to concentrate the tests where they're yielding results, i.e., positives. (Although Floyd Landis's disputed positive test from last year was on a post-stage urine sample). Yes, the idiocy continues, and will continue as long as there are pretty good odds if you dope you won't get caught. Why not just hire twenty certified phlebotomists and delay the start of the toughest Pyrenees stage by an hour next year and pull blood from every rider? And make sure all the samples are analyzed and results announced before they roll into Paris. Preferably by a lab that follows rigorously correct scientific procedures. Yeah, it would be expensive to run all those tests. So? How expensive is all the bad publicity and infighting and accusations and uncertainty? Update: A step in the right direction - The Tour of Spain organizers have announced that they will conduct at least 40 blood tests for EPO among 80 or more unannounced tests, and "On Aug. 30, when all the riders are assembled for the start in Vigo, a medical team will submit every participant to a health and doping test." And how about EPO and blood doping tests on the top twenty riders in the standings for both the general and mountains classifications immediately before or after the toughest mountain stage of the Tour? That would show they're really serious about weeding out any drug cheats.